The National Air and Space Museum (NASM)) of the Smithsonian Institution holds the largest collection of historic aircraft and spacecraft in the world. 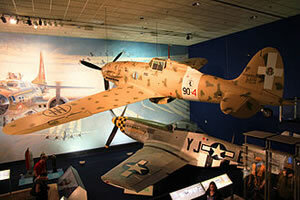 It was established in 1946, as the National Air Museum and opened its main building in 1976. It is a center for research into the history and science of aviation and spaceflight, as well as science and terrestrial geology and geophysics. Almost all space and aircraft on display are originals or backups to the originals.